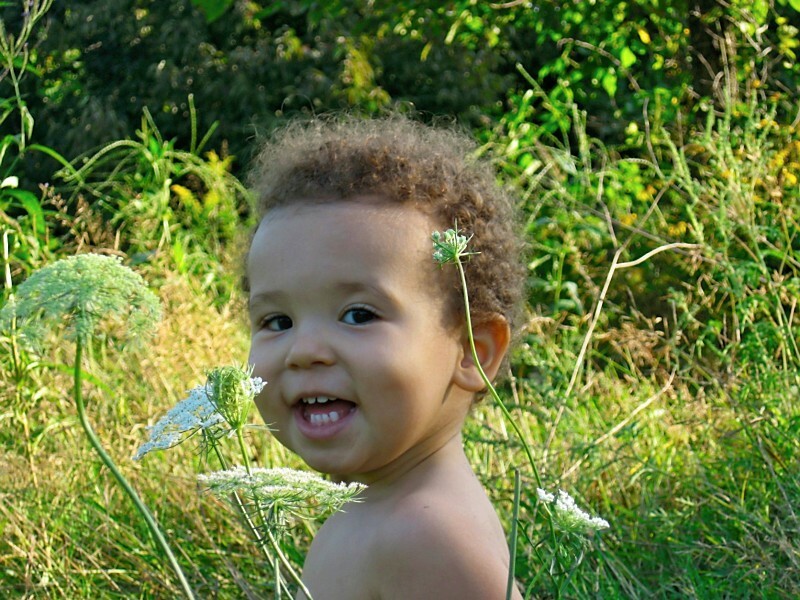 Before I had the baby monkey I labored under the delusion that I would somehow be immune to thinking that my baby was the cutest, most wonderful, most special, most delightful, most intelligent little nonverbal pants pooper ever. But, really, I did think I’d somehow be able to have some perspective on my own kid. I’d be able to acknowledge if he wasn’t cute (which, obvs, non-issue. He is so cute. ), I’d be able to tell if he was just an average kind of baby. Cute? Yes, I think so. For some reason, I thought this was a good thing, a thing that would prevent me from becoming an annoying gushy mommy type. So, that being said, let me be gushy and annoying and tell you why I am sort of amazed at the Bobo right now. I think he is athletic. Like above average athletic. Like is obsessed with watching sports on TV, like the first words out his mouth every morning are “Dada” and “ball”, like his daycare provider tells us that she’s never had a kid as crazy about balls and as good at throwing them as he is. So, he likes sports, he loves balls (heh. ), he likes throwing. So what? 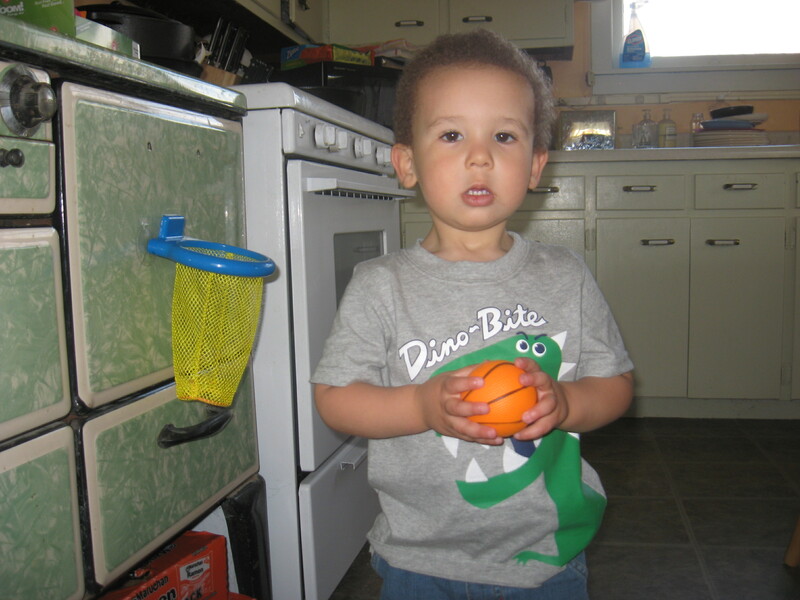 Well, there is this: he now winds up before he throws the baseball (we’ve never taught him to do that), he can run with a soccer ball and can dribble it with both feet. Then there is the small matter of basketball. 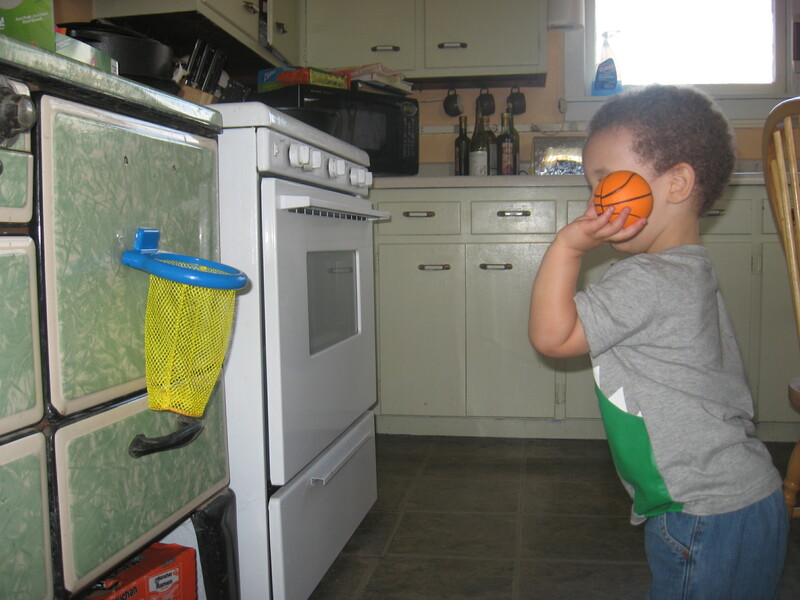 He has this little basketball hoop in the kitchen and he will go and practice shooting into it every night. I counted how many shots he took the other night and stopped counting at 100. He practices throwing and jumping at the same time (working on his jump shot? 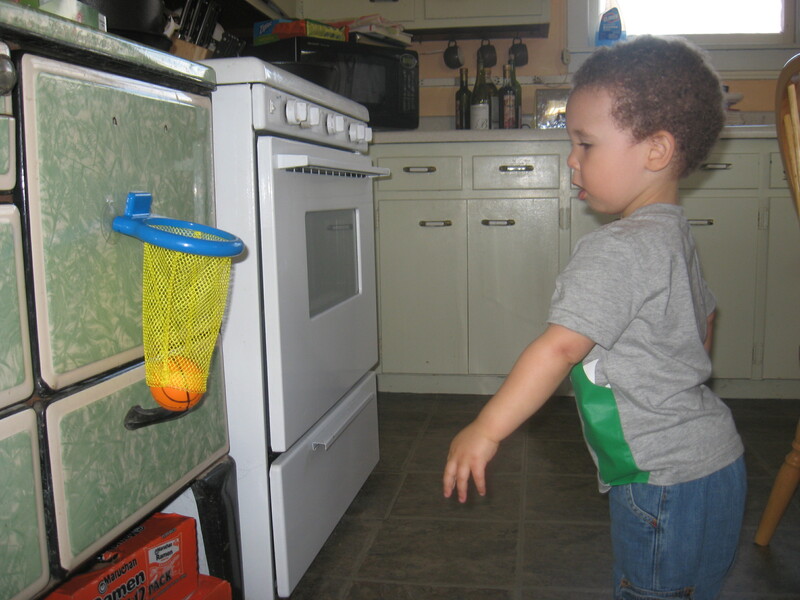 ), he practices shooting from a distance, he uses the oven door as a backboard. It is sort of amazing to watch him and to see the level of patience he has for doing this. He doesn’t make most of his shots, but he adjusts and keeps trying. If nothing else, if it turns out he isn’t really all that athletic, this would be enough. That he keeps trying. I do hope that he continues to like sports, both because I think it can make life socially easier for him (my inner nerd hopes elementary school and jr high will be easier for him) and because I want him to be healthy and to have that sense of satisfaction that I think pushing yourself physically can provide. That being said, off to the gym with me. I need to start pushing myself more. Maybe he got some of the few good TenElshof throwing genes. I got shortchanged but Dad was rumored to have quite the arm as a kid. Despite being blind in one eye he was able to pitch a no hitter in little league baseball (which is considered next to impossible). Before you were born Dad was a pretty serious softball player on the church league circuit and if my memory serves me right he was one of the better players on the team. Jeff and I went to most of his games when we were kids.